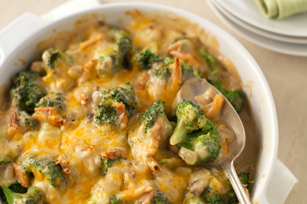 What makes this creamy broccoli side dish a family favourite? We think it has something to do with the creamy sauce, the cheesy topping and the toasted nuts. It might also have something to do with the fact that this veggie side dish goes with everything! Cook broccoli in boiling water 2 min. ; drain well. Meanwhile, melt butter in large skillet on medium heat. Add onions; cook and stir 5 to 6 min. or until crisp-tender. Whisk in soup, milk and Worcestershire sauce. Add 1 cup cheese; cook and stir 1 min. or until melted. Add broccoli and nuts to ingredients in skillet; mix lightly. Pour into 1.5-L casserole dish; top with remaining cheese.